Sweetnicks has a good thing going here. Nutritionally unaware people like me get a chance to review their diet (for the past, two weeks, I have been searching for antioxidants in my food) thinking about antioxidant-rich foods. Stephanie of Dispensing Happiness will be the guest host for ARF #6. Beets are a great source of antioxidants, although they do not figure in the top 10 popular ones. To me, beets are so underused. It is a pity that most people only use the canned version of them in salads. Their staining can be a problem but that is easily solved by rubbing your hands with lemon juice and salt mixture. I love the Indian way of making beets- a spicy curry with beets plays well with its sweet and spicy combination. 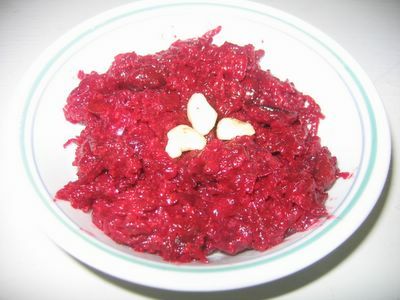 Sweet veggies are also used in India in desserts, be it green peas kheer, bottlegourd halwa, carrot halwa or this beet halwa. The sweetness in beets allows you to get away with adding about 4T extra sugar or so. Believe me, other Indian sweets take as much as a cup. I like to pressure cook the beets till they are not too soft. This is quicker than cooking them raw in milk. 1. Peel and grate the beets. Heat ghee in a saute pan and add the beets. Saute for 2 minutes. 2. Add milk to completely cover the beets. Cook on medium-low heat, until beets are mushy and milk is almost absorbed. Add the sugar and mix well. Cook till dry. 3. Mix in cardamon. 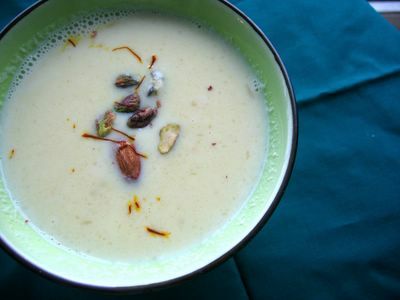 You can also toast some cashewnuts in ghee and add them at the end. Mika, I have never tried this before...have to give it a shot. What a festive-looking halwa! Mika, This is something new for me. I am going to have to try it. Thanks for the beet stain removing tip! Ooooooh! Lovely beetroot halwa! :) I LOVE it!